Worldwide auto sales rose to a record high 88 million last year off the backs of a record sales year in the U.S. 2016 unit sales are expected to approach 90 million and exceed 100 million by 2020, according to market research forecasts. Accounting for less than 1 percent of global light-duty vehicle sales in 2015 (1.3 million units), electric vehicles (EVs) will become a more economic option than gasoline or diesel cars in most countries over the course of the next decade as the cost of batteries continues to decline, Bloomberg New Energy Finance (BNEF) predicted in a February market research report. The market for rechargeable, plug-in EV batteries will rise $10 billion by 2020, according to a Lux Research forecast and report released June 28. Six automakers will account for 90 percent of total demand: Tesla, BYD, Volkswagen, GM, Renault-Nissan, and BMW. Panasonic will maintain its position as the world’s top plug-in EV battery manufacturer with a 46 percent market share. BYD, LG Chem, NEC and Samsung SDI will follow, Lux highlights. “Plug-in adoption is ultimately being fueled by rapidly decreasing battery costs and the success of early EVs such as Tesla’s Model S and Nissan’s Leaf, which has forced a number of other OEMs to make more serious commitments to developing plug-in vehicles,” Robinson was quoted. 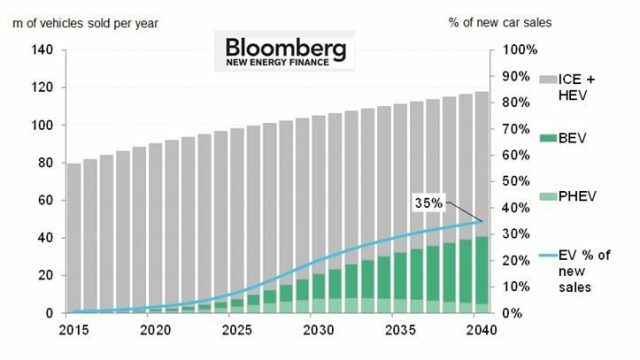 EVs will take a giant share of battery demand. Plug-in hybrid electric vehicles (PHEVs) will do well in unit sales, accounting for 740,000 of 1.5 million plug-in vehicles. Still, EVs will account for over 80 percent of the energy storage demand, due to their larger battery packs. Tesla’s dominance will grow. 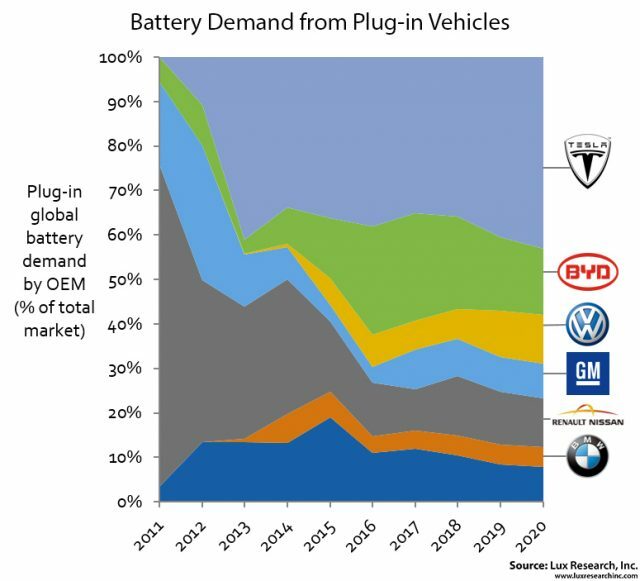 Tesla, driven by its forthcoming Model 3, will continue to power the lion’s share of battery demand from EVs through 2020. Although the company is unlikely to meet its own aggressive sales targets, Tesla will still account for nearly half of the EV market’s battery consumption – followed by Nissan and GM. BYD will lose PHEV lead in 2019. BYD will dominate battery demand from PHEVs on the strength of robust sales driven by generous subsidies. But the Chinese company will cede its lead in 2019 when European and American carmakers gain ground. Volkswagen will show the most growth as it focuses on plug-ins following its emissions scandal, while Toyota will continue to lag in PHEV sales as it focuses more on hybrids and fuel cells.